This is the first time at your blog. I like how you have posted something special from different places in the south. You have a nice blog here and I am very happy to follow you. 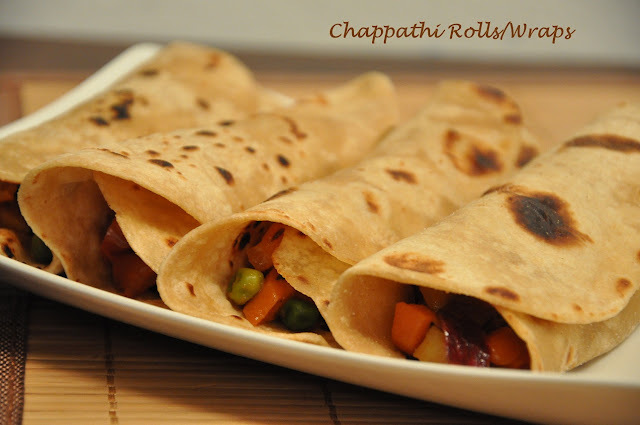 The chapati rolls are very healthy and worth a try. I usually make them with a layer of egg..
Nice alluring one !! love to have them right away !! Delicious comfort rolls .. Perfect with kids, healthy!! Wat a healthy and super filling rolls..loving it.. These chapathi rolls reminds me of my childhood .. my mom used to give me chapathi rolls in my tiffin, loved it. delicious chapati rolls dear...a very simple n healthy recipe !!! I'm vegetarian and i learn a lot with your recipes. This chapatis is so delicius and easy for cooking. Thank you and i would like recive in my mail your recipes!